Amazon Is Making Utopia Series With Gillian FlynnThe author has also signed an overall development deal with Amazon Studios. How Does the End of Sharp Objects Compare to the Book?The novel and the show soften the story in different places. Sharp Objects Is the Ultimate Gillian Flynn NovelYears before the HBO show, Flynn’s debut thriller was ugly, gritty, weird, and creepy in the best possible way. 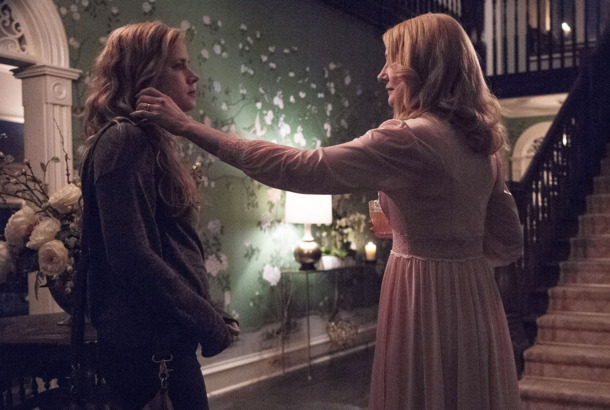 Sharp Objects Is So Much More Than a Small-Town Murder MysteryThe HBO mini-series is a psychological exploration of the many ways that society hurts and manipulates women. Being on House of Cards Was One of the Highlights of Patricia Clarkson’s CareerShe also teased some details from the set of the upcoming HBO mini-series Sharp Objects. Liam Neeson Rumored to Be Viola Davis’s Husband in Steve McQueen’s WidowsThe heist thriller also stars Elizabeth Debicki, Cynthia Erivo, and Michelle Rodriguez. HBO Nabs Amy Adams’s Sharp Objects SeriesThe premium cable channel reportedly won a bidding war with Netflix. Television Is Finally Cool Enough to Win Back Amy AdamsSharp Objects is being shopped as a TV series. David Fincher Puts Ben Affleck’s Evasiveness to Good Use in Gone GirlThe movie is phenomenally gripping—although it does leave you queasy and uncertain. Gone Girl’s Gillian Flynn Signs Two-Book DealOne of those books will be a YA novel. Summer’s Almost Over, So Read One of These Twelve Books AlreadyYou’ve got a little less than three weeks left until Labor Day. So pick up a book already. The Vulture Diaries: Gillian Flynn’s Week in Pop-Culture ConsumptionThe author of Gone Girl logs seven days of pop-culture consumption. ‘Notes from the Underbelly’: We Hate Babies. Also: Jokes.